Having practiced integrative/natural medicine for some 30 years, I understand your frustration. I have increasingly heard these kinds of thoughts and ideas being expressed about what you want for yourself and your family’s health. Your dissatisfaction with most methods of treatment has resulted in your desire for new approaches to health care and your thirst for knowledge has led you to become more determined about finding ways to help yourself. 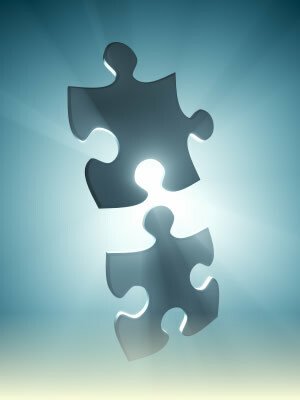 However, with so many options available, how do you begin putting the pieces together? If I asked you how to go about assembling a jigsaw puzzle, you would likely have a strategy of matching colors or using the straight edge pieces of the border to get things started. Of course, even as it comes together you need to have all the pieces otherwise the picture would be incomplete. Resolving your health issues is similar. For example, while detoxifying your body from everyday exposure to chemicals and toxins is beneficial, some people come to me feeling awful from a detox program they were trying. Usually they began the process before their body was able to detoxify efficiently. Others are exasperated because, although their research revealed that enzymes and probiotics would be the answer to their intestinal problems, they are still suffering. They simply may be missing some of the other pieces their body needs to complete the picture of their digestive health. It is essential to emphasize that it is just as important to correct health issues in their proper sequence as it is to have all the pieces. The digestive system is critical for good health and is the entry point for correcting imbalances in many people. Obviously, the proper processing of the food we eat is essential if we are trying to rebuild the body. However, the digestive system also houses 70-80% of the immune system in its associated lymphatic structures. So, food allergies and other imbalances in the digestive system can directly cause or contribute to a host of conditions ranging from everyday allergies to more chronic problems such as IBS, rheumatoid arthritis, fibromyalgia and Lupus. If that isn’t enough, some 80% of the nervous system’s serotonin is stored in the digestive system. Serotonin is known as the “happy” neurotransmitter and deficiencies caused by digestive imbalances contribute directly to anxiety and depression. So, it is not hard to see why balancing the digestive system is a key place to start. Once the digestive system is working correctly, it makes sense that moving on to step #2 and implementing dietary and other lifestyle changes will have a better opportunity to be effective for weight loss or generating more energy since you are now getting more nutrients out of the food you are eating. And, this is the appropriate place to mention how subsequent steps can also impact on the previous step. For example, if you balance your digestive system but then continue eating a high level of processed foods or sugar, it won’t be long before your intestinal health reverts back to its imbalanced state. Each step leads you into the next, and in turn, it supports the previous step in the process. With digestive balance and lifestyle changes in place, you are already progressing into correcting your body’s pH and reducing toxicity. A digestive system that is free of “bad” micro-organisms certainly reduces your toxic load and a diet high in fruits and vegetables goes a long way toward alkalizing your body. At the same time, a good functioning digestive system makes it much easier for toxins to be removed from your body, reducing many of the adverse symptoms that can accompany a detoxification program. Implementing the first three steps causes the health barriers to be either greatly reduced or eliminated, causing your body’s “energy” to run into fewer obstacles and to flow much easier and cleaner throughout your entire system. As a result, you are more grounded, centered and in touch with your environment with a higher vitality. So…now that you have the sequences to follow, you still need to be able to discover all of the correct pieces of the puzzle to complete the whole picture of each step. Any pieces that are missing stick out like a sore thumb, limiting your outcome. For example, you may be taking enzymes and probiotics for your digestion but still experience more gas, bloating and problems with bowel movements than you would like. Your digestive puzzle is not complete until you learn you also have food allergies as a primary problem. Other individuals may find they have an overgrowth of bad bacteria and need something additional to help them get rid of their uninvited guests. This frames an important point. One size does not fit everyone! Everyone does not have food allergies or yeast or bacteria or enzyme deficiencies. So, your digestive puzzle may look completely different from your friend’s picture. And, to add another slight twist, YOUR body’s metabolism may require a totally different nutritional supplement than your friend needs to balance the same type of issue in their digestion. What works to eliminate your yeast may fail miserably for someone else, creating some potential confusion in the process until you simply understand this “one size does not fit everyone” concept. Fortunately, there are muscle testing procedures you can learn to help you not only uncover your own missing health pieces, but also to determine which specific supplements work best with your individual metabolism. During my 30 years of clinical practice, I have found these procedures to be an invaluable tool in helping me with the most difficult of cases. In closing, following the steps in the correct sequence and learning to uncover the unique pieces of the puzzle will allow you to reclaim your health. Dr. Springer has practiced functional/natural medicine for 30 years and is the co-founder of Personal Health Connections which delivers a series of hands-on training workshops to empower you with the skills and knowledge to take back your health. You can learn more by calling 727-244-5630.